Set in L.A.'s infamous Sunset Strip in 1987, "Rock of Ages" tells the story of Drew, a boy from South Detroit and Sherrie, a small town girl. Both are in L.A. to chase their dreams of making it big and falling in love. This feel good, five-time Tony Award nominated musical is in its second National tour. Shannon Mullen portrays Sherrie. In the Spotlight (ITS) caught up with Shannon to get her viewpoint on this retro 80's rock musical. ITS: Let's first ask how you got your start in the music business. Shannon: I worked hard at roles as Tammy in “Hairspray” and then as Brooke in “Legally Blonde,” in which I was assigned dance captain. 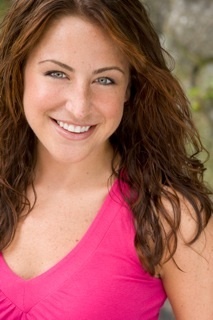 ITS: How did you get the break to play the lead role of Sherrie in this tour of "Rock of Ages"? Shannon: Very lucky! I knew the type of singing style I was capable of - this rock belter style in the show. I made a video and sent it to the casting director in New York. I was at SUNY in Buffalo in 2009. Two days before rehearsals for "Rock of Ages," I got a call. After callbacks, I got the role. I was ecstatic and cried a lot. ITS: How is the fourth wall broken between cast and audience? Shannon: The character Lonnie, who is our narrator, talks directly to the audience. ITS: Do you have a favorite song? ITS: Who inspired you to sing? Shannon: My fun uncle was a child of the 80's and played this music when I was a little girl. Later, Celine Dion became a role model. Now, the music from any Broadway show, especially “Hairspray” and “The Lion King,” has influenced me. ITS: Any humorous anecdotes to share? Shannon: Lots, but a moment between Dominique Scott (Drew) and myself, as we exit on opposite sides and pass each other to reappear on stage...we catch the glimmer that keeps us going. ITS: Any future aspirations for Shannon Mullen? Shannon: Absolutely! Bring on anything with song and dance. "Don't Stop Believin'." This show is intended for an audience members age 14 and above. For the second “Masterworks” series of her debut year, Music Director Carolyn Kuan led the Hartford Symphony Orchestra in an exciting program of opera excerpts by five composers, featuring three overtures and two complete semi-staged acts. A rousing performance of Wagner’s dramatic "Flying Dutchman Overture" captured the eerie mood of that composer’s first successful opera and set the stage for Act III of Verdi’s "La Traviata," in which Violetta is reunited with her estranged lover, Alfredo, later joined by his father, Germont, only to die of consumption at the opera’s close. The 35-minute scene was movingly rendered by students in the Yale Opera program at Yale University, with only Violetta’s bed, a table, and two chairs as unobtrusive props. After intermission, Kuan began the second half of the program with a lively account of the playful Overture to Mozart’s "The Marriage of Figaro." Next came the 20-minute Act III of Puccini’s "La Boheme," which finds the lovers Rodolfo and Mimi reuniting after an argument and their friends Marcello and Musetta separating after an argument. A mostly different cast of Yale students again turned in beautifully engaging performances. The concert ended on a high note with Offenbach’s exuberant "Overture to Orpheus in the Underworld," whose diverse elements of humor, pomp, and dance Kuan unified into a brilliant whole. All the artists were excellent, with special praise to soprano Jamilyn Manning-White (Violetta) and baritone Cameron McPhail (Germont, Marcello), whose gorgeous voices and nuanced acting skills make them talents to watch. The orchestra, too, sounded wonderful throughout, from Wagner’s blazing brass, to the lush strings of Verdi’s prelude, to Offenbach’s many solo turns. A number of empty seats suggested that some HSO patrons may have feared the prospect of a night at the opera. They needn’t have worried, as the Maestra’s concise and earthy introductions to both acts summarized the main characters and the action preceding the staged scenes. Her explanation of Offenbach’s uniquely comic take on the story of Orpheus and Eurydice was hilarious. The appreciative audience applauded all three of these pieces with standing ovations. Shantala Shivalingapppa brought a reverent and appreciative audience back in time to an Indian temple in her Bowker Auditorium presentation of Kuchipudi classical dance. Alone with four musicians on the stage, she both interpreted a narrative and made a religious statement with her choreography. Body movement was agile and athletic, hand and facial movement explicated a story, and she captured complete attention throughout. As Ranjana Devi explained in her pre-concert talk on Indian classical dance, dance is theatre, and music is integral to it: "Without music there is no dance." Four musicians provided vocal expression of story line, flute embellishments, and percussion in absolute synchronization with Shantala's feet. They became a team of five and showed a total dedication to each other and to this art form. Its religious meaning was apparent to the largely western audience, even if the narrative was difficult to follow. Kuchipudi dance is one of nine government-defined classical dance forms performed by women only, and is characterized by leaps and jumps. Shantala was costumed first in purple and then in white. Henna adorned her fingers and toes, making her long limbs appear even longer. The seven-part program began with an invocation to Ganesha, elephant-headed god of new beginnings and ended with Pasayadan, a prayer of peace and joy for all beings. The stage was mimimally decorated with diaphonous curtains and a small Shiva statue on one of several transparent shelves that floated above the floor. Swayambhu was offered as part of the Asian Arts and Culture Program at UMass. Now almost 20 years old, the program includes diverse offerings to schools, audiences, and the general community. It illuminates the vast cultural heritage of many Asian and Middle Eastern countries by showcasing events and capturing touring artists for one-time performances here. Kudos to the Fine Arts Center for continuing to support this program.